Comics are for everyone: Marjorie Liu, Ming Doyle & Erica Henderson offer advice to new creators at LadiesCon 2018 – AiPT! It’s not a controversial statement. At least, it isn’t for the more rational members of the comics-consuming audience. Still, in these politically charged times, it’s easy to see how even-keeled fans could begin to worry about the stability of the medium they love so much. To those with concerns, I say take a step away from the sensationalized headlines and toxic back-and-forths on social media and instead look to local events like LadiesCon. The 2018 edition of this celebration of women’s contributions to comics and related areas of interest was held September 23 in Somerville, Massachusetts, and like last year, the event’s message continued to be one of positivity and inclusivity. “LadiesCon is for everyone, with a focus on creators who identify as women, non-binary, LGBTQ, and people of color, plus local artists,” LadiesCon’s website reads. 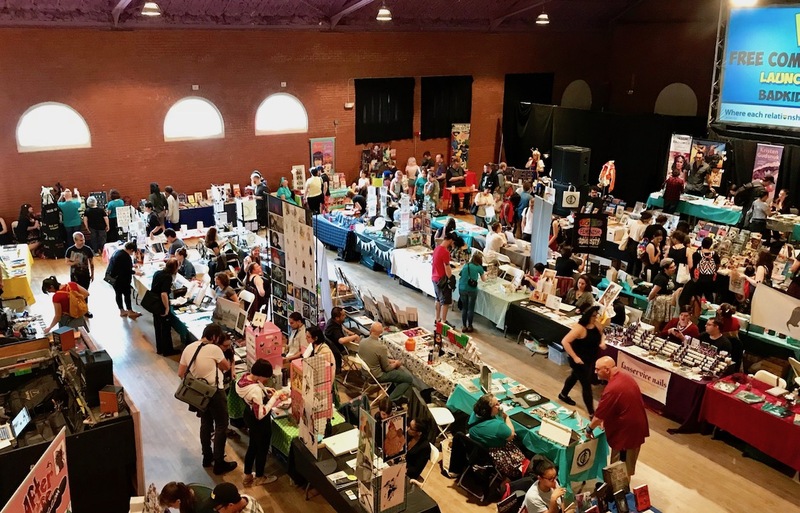 The event, organized by The Ladies of Comicazi, didn’t disappoint, with attendees of all ages (some cosplaying as their favorite characters) packing Somerville’s Center for the Arts at the Armory to attend panels and interact with the local artists and vendors tabling. Attracting many eager fans were this year’s special guests: Ming Doyle (DC Comics: Anatomy of a Metahuman, The Kitchen), Erica Henderson (The Unbeatable Squirrel Girl, Jughead), Kristen Gudsnuk (Henchgirl, Modern Fantasy), Jason Badower (Arrow, Krypton) and Marjorie Liu (Monstress, Astonishing X-Men). Liu was among the creators impressed with just how fast LadiesCon has grown in three years and, of course, proud to be a part of it all. Marjorie Liu at LadiesCon 2018. Although you wouldn’t have assumed as much based on the makeup of the LadiesCon crowd, as Liu mentioned, comics–like many industries–still struggles with inclusivity. It’s a fact that could make some aspiring creators doubt their place in the comics field, so I asked Liu and her fellow writers and artists what advice they may have for such individuals. Liu’s career path to comics, for instance, was anything but ordinary. Starting out as a lawyer, Liu then became a romance novelist before writing an X-Men novel that Marvel decision makers enjoyed. This led to writing gigs on such titles as Astonishing X-Men, X-23, Black Widow and Han Solo before she ultimately launched her creator-owned series Monstress, which has won multiple Eisner awards. Doyle also advised aspiring creators to just hang in there and keep at it. Erica Henderson explains the illusion of time in comics. Henderson, who just wrapped a 37-issue run as artist on The Unbeatable Squirrel Girl, pointed to the multitude of diverse comics already available to readers of all tastes and backgrounds. Surely, I’m not the only attendee to leave LadiesCon 2018 thinking that this event, its organizers, the creators it attracts and, of course, its fans comprise one of the more supportive and encouraging comics communities out there. Combined, all these factors should ensure that LadiesCon continues to be a successful force for good for many years to come. To learn more about the event, visit the LadiesCon website.